Featuring news (in sequence) from Malaysia, United Kingdom, USA, Jamaica, South Africa, Sri Lanka. The annual GULL graduation took place in the grand hall of the Malaysia Chinese Association (MCA) on 7 May. Regional President Vincent Tang has developed a vibrant network of GULL affiliated organizations and most of these centres provide skills training for young people who find employment as soon as they complete their studies. Every centre blends technical training with GULL’s action learning approach. It is encouraging to know that these young people are able to advance and improve because they understand the importance of self-directed development and lifelong learning. (Above right) Dato’ Dr Vincent Tang and Dr Richard Teare standing in front of the GULL backdrop in the 3000-seat MCA grand hall. The GULL network in Malaysia has expanded year on year since 2008 and the skills training provided by the associate centres equips young GULL participants for a wide array of career opportunities. The latest centre to join the network offers practical marketing pathways that include work experience to Certificate and Diploma awards. (Above left) The official opening of SP Academy, Seremban took place on Tuesday 9 May. The customary opening is preceded by a ‘lion dance’ and drumming. SP Academy Principal Henry Pang is pictured with Vincent (left) and Richard (right). (Above right) A meeting hosted by Celmonze Aesthetic Academy (CAA) specialists in beauty and wellness development and the first GULL associate centre to be established in support of the beauty industry. CAA works in every region of Malaysia and Singapore. The Salvation Army works in 127 countries and a small group based at the International Headquarters (IHQ) in London has designed and is implementing with GULL a self-directed development programme based on a series of action learning modular resources. (Above left) IHQ supports 1.5 million people for whom The Salvation Army is their church. They and the Army’s staff and volunteers around the world provide assistance of varying kinds in making a difference to more than 20 million people a year. (Above right) On 14 December 2016, the lead team received their M Prof Level 2 Certificate (Leadership Development) from Colonel Lisbeth Welander (centre) and Richard Teare (left) at the Salvation Army International Headquarters, London. Eurest’s Eastern Division (EED) has been using the GULL system to facilitate staff development since 2008. EED has integrated GULL with its operations and the selection of candidates, briefing and matching of students with an experienced business mentor is supervised by a District Manager. The 2017 graduation events took place in Philadelphia and Charlotte and included presentations of work and an interview about personal and professional change with Richard Teare. (Above left) Every graduate had a story to share and in Philadelphia, Alejandro Saquic said that learning at work enabled him to encourage his daughter in her studies. She was impressed that he we writing-up his diary each evening so they did homework together. (Above right) A group of Eurest with GULL graduates in Charlotte, all of whom reported on personal and professional development As a result, they said they felt even more committed to their work and to the company. CAN was founded in 2005 to serve low-income students facing barriers to college admission and graduation who are nearly four times more likely to leave college after their first year than students from higher income families. CAN worked with GULL Ambassador Elinor Alexander to create an action learning pathway centred on College coaching for university graduates serving as CAN volunteers. (Above left) CAN with GULL graduates: Elinor and her colleague Dee provided training on the essentials of effective coaching and helped the volunteers to apply them in their school placements. The volunteers also worked on their own development. The pathway was so successful that it will be provided to the next volunteer group. (Above right) Elinor also facilitated a meeting with Renton Ecumenical Association of Churches (REACH) who plan to create a GULL pathway to reduce the impact of homelessness. REACH knows that some of those who become homeless can find their own solutions. GULL supports a similar and successful project in South Africa. The first open Jamaica GULL group graduated in December 2010 and since then, Norma Taylor. GULL’s President, Jamaica has facilitated groups of participants in the workplace and the community. The 2017 graduation took place on 14 June at the Unity Faith Centre, Montego Bay. (Above left) ‘A mind once expanded should not return to its original form – our consciousness has been awakened and with it comes a new way of thinking.’ A reflection the GULL process by the late Revd Ena Grierson Thomas in September 2014. This year, Ena (second, right) was among the GULL graduates. (Above right) GULL student Richard Bennett (second, left) is better known by his stage name Charlie Chaplin. Richard is a Jamaican dancehall and ragga deejay and singer and it was common when he began for Jamaican deejays to name themselves after film stars or characters. His career began in 1980 and he became extremely popular throughout Jamaica, memorable for his focus on cultural and social themes. An audience of more than 5,000 guests, faculty and students of the Caribbean Maritime University (CMU) gathered at the National Arena, Kingston, Jamaica on 28 September for the Charter Ceremony – the occasion on which CMU became Jamaica’s second national university and the Caribbean’s first specialized public university. Principal guests included the Governor General and Prime Minister. CMU has an international reputation in maritime, logistics and related fields and is the first university in the Caribbean to offer GULL action learning pathways to participants in the community and the workplace. CMU has a vision for inclusion and will work with GULL’s National President, Jamaica to extend participation to marginalized groups. (Above left) GULL President, Dr Richard Teare (centre) pictured next to the Most Hon. 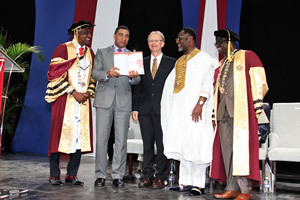 Andrew Holness, Prime Minister of Jamaica and CMU’s Chancellor, President and Deputy President. (Above right) Guests arrive for the CMU ceremony at the National Arena, Kingston. The Caribbean Maritime University has many mature, part-time MSc students who work in maritime, logistics and security industry sectors in Jamaica and elsewhere in the Caribbean. CMU is keen to provide them with continuing development opportunities and on Saturday 30 September, Richard Teare and Professor Ibrahim Ajagunna, Deputy President, CMU facilitated a workshop on applied research and publishing for some 40 postgraduates at the main CMU campus in Kingston. Richard will continue to provide developmental support as a visiting professor and with Ibrahim and Dr Norma Taylor, explore ways in which CMU with GULL can develop an inclusive learning hub for Jamaica - especially for those who are not able to participate in a traditional academic route. (Above left) Participants at the applied research and publishing workshop. (Above right) Ibrahim and Richard visited the Nigerian Ambassador to Jamaica on Tuesday 03 October. The Ambassador said she would like to enrol in a CMU-GULL pathway for senior practitioners. Dr Lesley Wood, Research Professor, North West University (NWU) is GULL’s honorary National President, South Africa and Lesley has established a network of five South African universities committed to deploying and evaluating the effectiveness of community-based learning via GULL in 2017-18 and beyond. Our aim is to develop and implement an inclusive approach to self-directed lifelong action learning – initially for South Africa and thereafter, for international adoption. The GULL system can be customized to meet specific needs without affecting its recognized status. Further, as a non-profit initiative it can be operationalized at low cost and in so doing, enables academic (campus-based) and community-based learning to co-exist. (Above left) NWU’s own in Stilfontein-based pilot group (community leadership) have made significant advances. (Above right) Participants from several South African universities at the NWU with GULL workshop on Tuesday 18 October. The office of Community Engagement held its annual University of the Free State (UFS) Community Award Ceremony on Friday 20 October in the UFS Physics Department. Head of Service Learning Karen Venter and Bishop Ramahlele, Director of Community Engagement, UFS have a wide-ranging vision for the deployment of GULL at UFS via its community partners and in conjunction with the Central University of Technology, also based in Bloemfontein. Advances in personal confidence and entrepreneurship have occurred in pilot group participants drawn from a shelter for homeless women. Prior to commencing their journey with GULL, participants were traumatized by past experiences and 12 months later, they are transformed and more self-reliant. (Above right) UFS staff and community partners enjoy lunch together after the GULL workshop on Friday 20 October. Participants all said that they want to advance with GULL. The South Asian Academy for Good Governance (SAAGG) affiliated with GULL in January 2010 and the outcomes of participants have been reported every year since then at a national symposium and celebration of good governance. The theme of this year’s event was ‘Right to learn, duty to share’ – closely mirrored by GULL’s inclusive, ‘cascade’ approach: First help yourself and then help others. The event was the 8th consecutive ceremony attended by Richard Teare. GULL’s rationale for participation has always been in support of the cause of ‘good governance’ but as few candidates opt for this development pathway, GULL’s work with SAAGG is no longer sustainable and so this was his farewell visit. (Above left) Cultural dancing at the opening of this year’s event. (Above right) The cause of ‘good governance’ is an important one – but there are insufficient active participants to sustain GULL’s participation. Thank you to the final batch! Features news (in sequence) from Malaysia, the United Kingdom, the USA, Jamaica, South Africa and Sri Lanka. A key feature of this year’s work has been the expanding partnerships with public universities in Jamaica and South Africa. The aim here is to provide the GULL system in support of deeper level community engagement. Three South African universities successfully concluded GULL pilots in 2017 and four more will begin piloting GULL in 2018. This initiative will enable universities to adopt a more inclusive approach to learning in the classroom and the community.